It was a great idea in theory. I have a super suction-y suction cup mount for my GoPro camera. I have a sun roof. It’s a beautiful time of year here in the Finger Lakes. I’d stick the GoPro on there and let er’ rip on my gorgeous morning drive to work. I turned around, parked in a driveway. Surely it would be on the side of the road, safe and sound, totally visible. It was no where in sight. 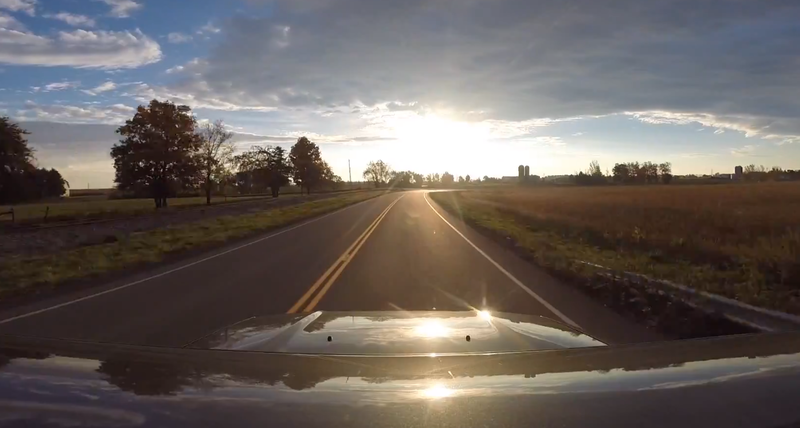 So, here’s how you find a GoPro camera when it flies off your car. Bookmark this page, you may need it someday. 1) First of all, make sure the wifi signal is on to begin with. If not, there is no hope of finding it in weeds. 2) Walk slowly along the area you think you lost it. Try not to get hit by a horse and buggy. Try not to look suspicious. 4) Good news. If you can pick it up, you’re not too far from your camera. 7) In the app, go to the GoPro settings. Down near the bottom, there’s a “find camera” option. Turn it on. 8) Listen for the continuous beeping. 9) Go to where the beeping is coming from. There’s your camera. I found the camera down in some very tall grass, in a very steep ditch. I would NEVER (NEV. VERR.) found it without the wifi. It was no where near being visible. There are a few deep scratches on the camera’s waterproof housing, but it’s still usable and seals up like it should. No worries. Lesson: tether you GoPro’s folks! So here’s the footage… my beautiful drive, followed by a GoPro flying through the air and rolling off the road, followed by me almost hitting a fox. If you’re a Yates County-an, this is Himrod Rd going out of PY, which turns into Chubb Hollow. Then a left turn on Rice Rd, which is a goooooorgeous little stretch of road that goes into Himrod. Just gorgeous.